Shopping for the right components for your automatic control processes means weighing the needs of the system in terms of performance against both the costs and the timing demands necessary to produce it to order. This means that when you are designing those systems, you need actuators with the precision to meet your quality control specifications and the speed to keep your entire system in balance. What is an actuator? It’s the part of the system that executes, or actuates, the command from the control to perform a mechanical action. There are several kinds, and they are involved in everything from automated manufacturing processes to boiler control for power plants and heating systems, wastewater treatment, and many more applications. Fluid control systems allow for everything from the treatment of a city’s water and wastewater to the regulation of building heating systems and even the power plants that run entire cities. To do this, they depend on flow control valves and the actuators that control them. The rise of automated systems across industries has led to growth projections in the demand for actuators that see expansion clear to 2023. 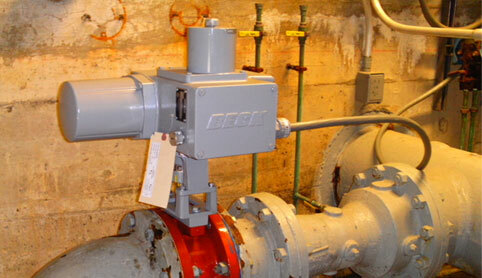 What is an actuator good for if it is less reliable than having a manual operator? This is the limiting factor in many processes that prevent their automation. If you’re looking for an actuator manufacturer in the USA whose product offers a level of speed and precision unmatched by other models, you need an actuator that performs consistently. That way, you’re going to be able to deliver a consistent performance throughout the fluid control system you’re designing or updating. It’s also important to remember the shipping costs and times associated with suppliers. If you’re in the USA, it’s a good idea to find an electric actuator manufacturer in the USA. All industry analysis points to the continued rise of automation in many industrial processes, from the extraction of resources to the production of energy and manufactured goods. It contains costs, increases output, and allows businesses to do more with the same resources. That is driving a push to automate more and more industries. You should consider working with the kind of supplier who constantly asks the right questions and then delivers answers that have the best, most relevant and well thought-out solutions for your infrastructure. Harold Beck and Sons has been making flow control valve actuators for a variety of applications since 1936 and continues to improve upon an already strong product line.